In Indonesia, the word sumunar means a glowing, brilliant light–one that is radiant and beautiful, and one that illuminates and warms the soul. Dedicated to teaching, performing and sharing the arts and culture of Indonesia, Sumunar invites you to be a part of the luminous light. Whether you’re enjoying a concert, taking a gamelan or dance class, or learning more about Indonesia, our goal is to share the rich sounds, stories and traditions of Indonesia with you in an open and relaxed environment. Sumunar is among the Twin Cities’ cultural treasures that can be enjoyed by all ages. 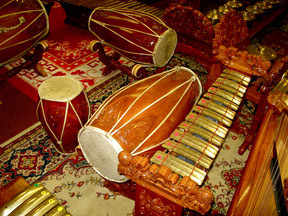 Check out Sumunar’s newest resource, a series of instructional videos of gamelan instruments, played by master musicians.